i just saw this recently and was captivated by it. i cried like a baby at the end. it’s quite possible i may have been pms-ing, which would account for the extreme emotional reaction, but it was genuine at the time. a really good film for sure. 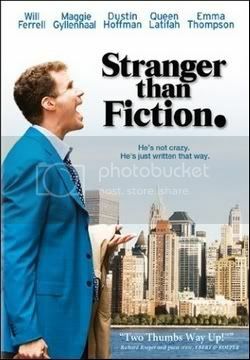 plus i love will ferrell in just about anything he does and it was great to see him in a not-so-overtly-funny performance. Hey — PMS emotions are real too! Now that I’m getting closer to menopause I cry way more than I used to. It isn’t really a bad thing, sort of a gift of middle age to finally be less afraid of my own feelings. Wait,this has nothing to do with the movie. Which I haven’t seen yet. But I’m impressed at the overall quality of films that Will Farrell has made. As SNL alums go, he seems to have developed one of the more credible film careers. I’ve seen him on the Tonight Show too, and he seems like a decent fellow. Great flick, surprising flick… really I didn’t expect the depth that it has. That and the Will Ferrell character I can relate to… imagine how that works. Marcy, I was the same way when I saw it and I don’t think I was PMS’ing, I think it is an overall touching film…But then again I cry at a lot of movies. i wanted to BE maggie in this movie. I saw this movie in the theater. I saw the preview and wanted to see it badly. It didn’t disappoint me at all. In fact it was better than expected.